This article is about the heroine of the Book of Esther. For the book of Esther, see Book of Esther. For other uses, see Esther (disambiguation). 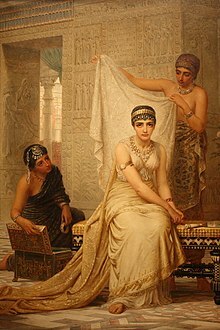 Esther[a] is described in the Book of Esther as a Jewish queen of the Persian king Ahasuerus (commonly identified as Xerxes I, reigned 486–465 BCE). In the narrative, Ahasuerus seeks a new wife after his queen, Vashti, refuses to obey him, and Esther is chosen for her beauty. The king's chief advisor, Haman, is offended by Esther's cousin and guardian, Mordecai, and gets permission from the king to have all the Jews in the kingdom killed. Esther foils the plan, and wins permission from the king for the Jews to kill their enemies, and they do so. Her story is the traditional basis for Purim, which is celebrated on the date given in the story for when Haman's order was to go into effect, which is the same day that the Jews killed their enemies after the plan was reversed. According to most scholars, the name Esther is derived from the Mesopotamian goddess Ishtar and/or the Persian word stara, "star". The Book of Daniel provides accounts of Jews in exile being assigned names relating to Babylonian gods and "Mordecai" is understood to mean servant of Marduk, a Babylonian god. "Esther" may have been a different Hebrew interpretation from the Proto-Semitic root "star/'morning/evening star'", which descended with the /th/ into the Ugaritic Athtiratu and Arabian Athtar. The derivation must then have been secondary for the initial ayin to be confused with an aleph (both represented by vowels in Akkadian), and the second consonant descended as a /s/ (like in the Aramaic asthr "bright star"), rather than a /sh/ as in Hebrew and most commonly in Akkadian. Even in Talmudic times it was realized that the name Esther was of foreign origin. According to one opinion mentioned in the Talmud (Tractate Megillah 13a) and Yalkut Shimoni (1053:7) as well as Targum Sheni the name Esther comes from אסתהר (‘īstəhăr), the morning star Venus. Modern scholars starting with Assyriologist Peter Jensen added on to this by connecting Esther with Ishtar Babylonian goddess of the planet Venus, and this view came to be adopted by almost all commentators. A. S. Yahuda conjectured that the name Esther is derived from a reconstructed Median word astra meaning myrtle. This would match her Hebrew name as recorded in the Bible, Hadassah, also meaning "myrtle". In the narrative, King Ahasuerus is drunk at a festival and orders his queen, Vashti, to appear before him and his guests to display her beauty. When she refuses to come, he deposes her and seeks a new queen through a sort of beauty pageant. Esther, an orphan daughter of a Benjamite named Abihail and under the protection of her cousin Mordecai, who are members of the Jewish exile community in Persia, is chosen. Later, Mordecai refuses to bow to Haman the Agagite, who was recently made Ahasuerus' highest advisor, and Haman requests and is given permission to order all the Jews in Persia to be killed. When Esther learns of this, Mordecai tells her to reveal to the king that she is Jewish and to ask him to repeal the order. Esther hesitates, saying that she could be put to death if she goes to the king without being summoned and the king does not want to see her; Mordecai urges her to try. She goes to the king, and the king welcomes her, and says he will give her anything she wants. Instead of asking directly about the order, she invites the king and Haman to a banquet the next day. During the banquet, the king again asked Esther if there is anything she wants, and this time she asks the king to spare her life and that of all of the Jews. The king asks who was threatening them, and she names Haman. Haman throws himself at her feet; the king thinks that Haman is attacking her and orders him to be put to death, and gives all Haman's possessions to Esther. Esther tells the king about Mordecai's role in her life, and the king makes Mordecai his highest advisor. Esther then asks the king to revoke the order, and king allows Esther and Mordecai to do so, however they wish. They send out an order in the king's name that Jews can assemble and defend themselves, and can kill anyone who threatens them, and their families, and take their goods. On the thirteenth day of Adar, the same day that Haman had set for them to be killed, the Jews do so in one city, killing 500 people but not taking plunder, and they kill around 75,000 the next day again not taking plunder, and then they feast. The Jews established an annual feast, the feast of Purim, in memory of their deliverance. Haman set the date of Adar 13 to commence his campaign against the Jews. This determined the date of the festival of Purim. Dianne Tidball argues that while Vashti is a "feminist icon", Esther is a post-feminist icon. Abraham Kuyper notes some "disagreeable aspects" to her character: that she should not have agreed to take Vashti's place, that she refrained from saving her nation until her own life was threatened, and that she carries out bloodthirsty vengeance. The tale opens with Esther as beautiful and obedient, but also a relatively passive figure. During the course of the story, she evolves into someone who takes a decisive role in her own future and that of her people. According to Sidnie White Crawford, "Esther's position in a male court mirrors that of the Jews in a Gentile world, with the threat of danger ever present below the seemingly calm surface." Esther is related to Daniel in that both represent a "type" for Jews living in Diaspora, and hoping to live a successful life in an alien environment. According to Susan Zaeske, by virtue of the fact that Esther used only rhetoric to convince the king to save her people, the story of Esther is a "rhetoric of exile and empowerment that, for millennia, has notably shaped the discourse of marginalized peoples such as Jews, women, and African Americans", persuading those who have power over them. Given the great historical link between Persian and Jewish history, modern day Persian Jews are called "Esther's Children". 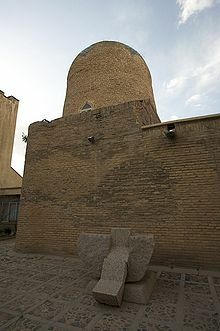 A building venerated as being the Tomb of Esther and Mordechai is located in Hamadan, Iran, although the village of Kfar Bar'am in northern Israel also claims to be the burial place of Queen Esther. There are several paintings depicting Esther, including one by Millais. Esther before Ahasuerus is one of the most commonly depicted parts of the story. The status of Esther as a canonical book of the Bible has historically been under dispute. For example, in the first several centuries of Christianity, Esther does not appear in the lists of books produced by Melito, Athanasius, Cyril, Gregory of Nazianzus, and others. Additionally, no copies of Esther were found at Qumran in the contents of the Dead Sea Scrolls. Nevertheless, by the fourth century CE, the majority of Western churches accepted Esther as a part of their Bibles. Esther is also commemorated as a matriarch in the Calendar of Saints of the Lutheran Church–Missouri Synod on May 24. She is also recognized as a saint in the Eastern Orthodox and Coptic Orthodox Churches. "The Septuagint edition of Esther contains six parts (totaling 107 verses) not found in the Hebrew Bible. Although these interpretations originally may have been composed in Hebrew, they survive only in Greek texts. Because the Hebrew Bible’s version of Esther’s story contains neither prayers nor even a single reference to God, Greek redactors apparently felt compelled to give the tale a more explicit religious orientation, alluding to "God" or the "Lord" fifty times." These additions to Esther in the Apocrypha were added approximately in the second or first century BCE. ^ /ˈɛstər/; Hebrew: אֶסְתֵּר‎, translit. ’Estēr), born Hadassah (Hebrew: הֲדַסָּה, Modern: Hadasa, Tiberian: Haḏasā. ^ Littman, Robert J. (January 1975). "The Religious Policy of Xerxes and the Book of Esther". The Jewish Quarterly Review. 65 (3): 145–155. doi:10.2307/1454354. JSTOR 1454354. ^ Brettler, Marc; Newsom, Carol; Perkins, Pheme (2018). "Esther". The New Oxford Annotated Bible: New Revised Standard Version. Oxford University Press. p. 715. ISBN 9780190276065. ^ Mary Joan Winn Leith (2011). Coogan, Michael D. (ed.). The Oxford Encyclopedia of the Books of the Bible. Oxford University Press. p. 252. ISBN 9780195377378. Esther, cognate with Ishtar... and/or the Persian word stara, "star". ^ Fox, Michael V. (2010). Character and ideology in the book of Esther (2nd ed.). Wipf & Stock. p. 30. ISBN 9781608994953. The name Esther is derived from either the name of the Babylonian goddess Ishtar or the Persian word stdra, "star". ^ Emil G. Hirsch; John Dyneley Prince; Solomon Schechter. "ESTHER - JewishEncyclopedia.com". www.jewishencyclopedia.com. ^ Huehnergard, John (2008-04-10). "Appendix 1: Afro-Asiatic". In Woodard, Roger D. (ed.). The Ancient Languages of Syria-Palestine and Arabia. Cambridge University Press. pp. 225–46. ISBN 978-1-13946934-0. ^ Rahmouni, Aïcha; Ford, J.N. (2008). "Section 1, The Near and Middle East". Divine Epithets in the Ugaritic Alphabetic Texts. Brill. p. 86. ISBN 978-900415769-9. ^ Offord, Joseph (April 1915). "The Deity of the Crescent Venus in Ancient Western Asia". Journal of the Royal Asiatic Society of Great Britain and Ireland: 198. JSTOR 25189307. ^ The Soncino Babylonian Talmud: Megillah (PDF). Soncino Press. pp. 47–48n15. ^ a b The Encyclopædia Britannica: A Dictionary of Arts, Sciences, Literature and General Information. At the University Press. 1910. p. 797. ^ Cassel, Paulus (1888). An explanatory commentary on Esther : with four appendices consisting of the second Targum translated from the Aramaic with notes : Mithra : the winged bulls of Persepolis : and Zoroaster. Edinburgh : T. & T. Clark. p. 300. ^ Koller, Aaron (2014). Esther in Ancient Jewish Thought. Cambridge University Press. p. 38n11. ISBN 9781107048355. ^ Yahuda, A. S. (1946). "The Meaning of the Name Esther". Journal of the Royal Asiatic Society of Great Britain and Ireland (2): 174. ISSN 0035-869X. ^ Yahuda, A. S. (1946). "The Meaning of the name Esther". Journal of the Royal Asiatic Society. 78 (3–4): 174. doi:10.1017/S0035869X00100413. ISSN 1474-0591. ^ Abusch, T. (1999). "Ishtar". In Karel van der Toom, Bob Becking, Pieter W. van der Horst, eds. Dictionary of Deities and Demons in the Bible. 2nd extensively rev. ed. Brill. p. 455. ^ Barton, John; Muddiman, John (2001-09-06). "Esther". The Oxford Bible Commentary. Oxford University Press. ISBN 978-0-19875500-5. ^ Hirsch, Emil G.; Prince, John Dyneley; Schechter, Solomon (1936). "Esther". Jewish Encyclopedia. New York: Funk & Wagnalls Co.
^ Crawford, Sidnie White. "Esther: Bible", Jewish Women's Archive. ^ Tidball, Dianne (2001). Esther, a True First Lady: A Post-Feminist Icon in a Secular World. Christian Focus Publications. ISBN 978-1-85792671-2. ^ Kuyper, Abraham (2010-10-05). Women of the Old Testament. Zondervan. pp. 175–76. ISBN 978-0-31086487-5. ^ Zaeske, Susan (2003). "Unveiling Esther as a Pragmatic Radical Rhetoric". Philosophy and Rhetoric. 33 (3): 194. ^ Vahidmanesh, Parvaneh (5 May 2010). "Sad Fate of Iran's Jews". Payvand. ^ Schaalje, Jacqueline (June 2001). "Ancient synagogues in Bar'am and Capernaum". Jewish Magazine. ^ McDonald, Lee Martin (2006-11-01). The Biblical Canon: Its Origin, Transmission, and Authority. Baker Academic. pp. 56, 109, 128, 131. ISBN 978-0-80104710-7. ^ Harris, Stephen; Platzner, Robert, The Old Testament: An Introduction to the Hebrew Bible, p. 375 . ^ Vanderkam, James; Flint, Peter, The Meaning of the Dead Sea Scrolls, p. 182 . ^ "Esther", LXX, EC Marsh . Zaeske, Susan. "Unveiling Esther as a Pragmatic Radical Rhetoric", Philosophy and Rhetoric, vol. 33, issue 3. Beal, Timothy K. (1997-12-11). The Book of Hiding: Gender, Ethnicity, Annihilation, and Esther (1st ed.). London; New York: Routledge. ISBN 978-0-41516780-2. Postmodern theoretical apparatus, e.g., Jacques Derrida, Emmanuel Levinas. Fox, Michael V. (2010-04-01). Character and Ideology in the Book of Esther: Second Edition with a New Postscript on a Decade of Esther Scholarship (2nd ed.). Eugene, OR: Wipf & Stock. ISBN 978-1-60899495-3. Sasson, Jack M. (1990). "Esther". In Alter, Robert; Kermode, Frank (eds.). The Literary Guide to the Bible. Harvard University Press. pp. 335–41. ISBN 978-0-67487531-9. Kahr, Madlyn Millner (1968). The Book of Esther in Seventeenth-century Dutch Art. New York University. Webberley, Helen (Feb 2008). "Rembrandt and The Purim Story". The Jewish Magazine. White, Sidnie Ann (1989-01-01). "Esther: A Feminine Model for Jewish Diaspora". In Day, Peggy Lynne (ed.). Gender and Difference in Ancient Israel. Fortress Press. ISBN 978-1-45141576-6. Grossman, Jonathan (2011). Esther: The Outer Narrative and the Hidden Reading. Eisenbrauns. ISBN 978-1-57506221-1. Wikimedia Commons has media related to Esther. "Esther" . New International Encyclopedia. 1905. Fachartikel in: Michaela Bauks, Klaus Koenen (Hgg. ): Das wissenschaftliche Bibellexikon im Internet (WiBiLex). 2007ff.